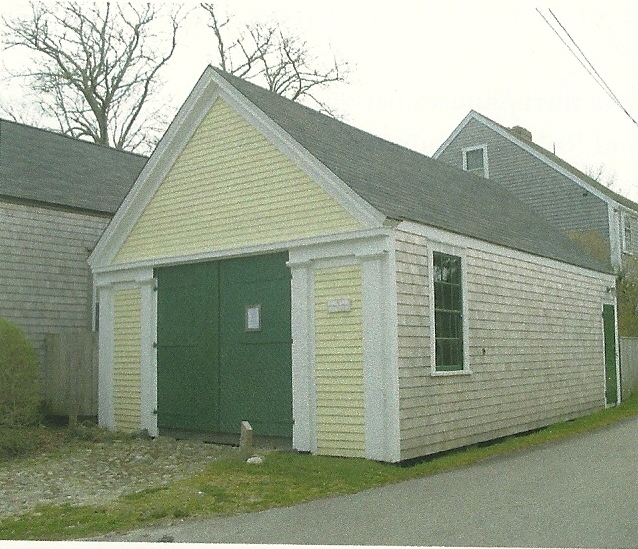 The Fire Hose Cart House is located at 8 India Street and is the NPT’s most recent preservation easement.This is the last remaining cart house on the island, which was recently restored by the Nantucket Historical Association. Today the cart house holds rare fire-fighting equipment related to the Great Fire of 1846 and is open in season. The Fire hose cart house was built forty years after the Great Fire, which destroyed approximately one-seventh of the downtown area. Although the fire devastated the town, it also led to improvements in fire-prevention and protection measures, including the construction of cart houses to store hand-pumped fire-fighting apparatus. By 1912, the Nantucket Fire Department had been recognized and the Gardner Street facility was soon abandoned, and in 1931, the town sold it to the owner of the adjacent land, William Macy Bartlett. In 1960, Miss Edith M. Bartlett, daughter of William Macy Bartlett and Lizzie A. (Nash) Bartlett, gave the land and the building to the NHA to be maintained as a memorial to her father and mother. Previous PostNational Historic Landmark UpdateNext PostDid you know?